health nurses (PHNs) and taught it to nursing students. 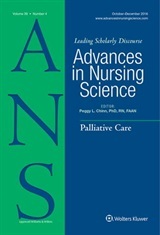 Although I had used Watson’s Caring Science to inform my own practice, as I taught public health nursing, I began to realize the influence of Nightingale as well as feminist and critical social theories on contemporary public health nursing practice. I see Critical Caring, therefore, as a descriptive mid-range theory of public health nursing that I have set into a theoretical framework. The study described in part in this article began in 2005. After the initial data were gathered, professional and personal circumstances made it impossible for me to continue with the work. I owe my most profound thanks to Claire Betker, a public health nurse with a breadth of public health nursing experience. Beginning her doctoral studies in 2010, Claire saw value in the theory and approached me about work we might do together. Together we began to analyze the data that, in turn, energized us to complete the study. public health nursing practice which she illustrated using a metaphor of a tree (practice) anchored by its roots (theory) where theory is nourished by practice and continues to evolve while supporting practice and giving it definition. This description of theory and the 7 carative health promoting process that represent the ‘core’ of public health nursing practice resonated with what I had experienced in practice, just as they did with the participants in the research described in this article. I encourage those within the pubic health nursing community to consider how Critical Caring could: a) guide practice; b) assist us to articulate and give voice to our practice and its importance; and c) be a tool of resistance to those forces that prevent PHNs from working to their full scope of practice. If you have already downloaded the new ANS iPad app, you can read this article now! All of the articles in the current issue of ANS are available at no charge on the iPad app, and on the ANS web site. Get your copy of this important article now! ← Update on Future Issue Topics!